Follow along in this dramatic chapter-by-chapter video series and discover a powerful message for today. Golden images, winged lions, proud kings, strange and magnificent creatures emerging from the sea, Judgment Day, and the Holy Sanctuary . . . they are all part of the fascinating, colorful book of Daniel. 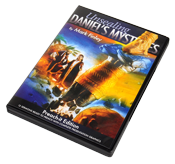 Pastor Mark Finley has deeply studied the Bible prophecies of the book of Daniel for over 30 years. He has taught hundreds of seminars on Bible prophecy all across the globe.